San Diego is famous for its warm climate, so why not indulge yourself by having your wedding day photography session in a balmy city that also contains some of the region's most renowned military wedding locations? For the sake of driving convenience, we recommend that you begin your wedding photography session in Fallbrook at the gorgeous Arbor Terrace inside the Grand Tradition Estate. Have your wedding photographer assemble the bridal party on the verdant lawn or beside the beautiful brick and marble fountain in front of the estate. Your photographer can then capture some intimate moments between bride and groom as they stroll around the terrace or embrace next to the lake. The estate's vibrant gardens and exotic waterfalls are also fair game for shots of the happy couple. Arrange for your limo driver to pick up the bridal party at the front gate and in twenty minutes you will arrive at the luxurious Los Willows Garden Estate. Another popular location for military weddings, San Diego treasure contains plenty of cozy little chapels and arches for some private moments. Your wedding photographer can gather the bridal party around the bride and groom as they take center stage on the deck that protrudes into the water. The adventurous couple can even take a chauffeured boat ride across the lake or have a horse-drawn carriage take them around the estate. 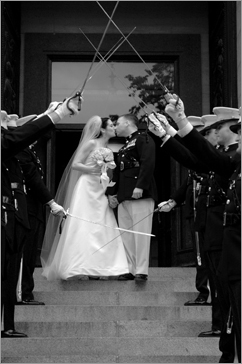 Both will make for some great photographs and either choice will serve as the grandest of entrances if you choose to have your military wedding here! Only a few minutes away you will find the Pala Mesa Golf Resort, which includes a plethora of spots for your wedding photography session. This charming resort's many potential photography locations include colorful flower gardens and picturesque waterfalls that will leave you breathless. The destination's stunning mountain views can serve as a spectacular backdrop for a portrait of the bride and groom and the elegant staircases inside the resort will be perfect to arrange the bridal party along. There is so much to explore at this renowned military wedding location, take care to make it back in time for the ceremony! This itinerary is just a start to your wedding experience and any of these gorgeous locations will make for an unforgettable day. The Mission Valley area near Station Miramar offers a variety of gorgeous locations for a San Diego military wedding. Start your wedding photography session at San Diego State University, whose campus contains plenty of beautiful architecture that will make for a great photo shoot. Have your wedding photographer situate the bridal party on the main Courtyard, either on its large green lawns or among the black marble benches. You can then walk over toward Hepner Hall, whose mission-style tower and brick archways will provide a perfect backdrop for a portrait of the military couple. Within short walking distance you'll find the vibrant Mediterranean Garden, as well as Scripps Cottage, which contains a miniature bridge that crosses over a tranquil little pond. After you've finished your photography session at the university, take a short limousine ride over to the lovely Mission Basilica. Once you arrive at California's first mission, your wedding photographer can assemble a photo of the bridal party on the red brick walkway leading to the entrance. The pure white mission walls and the dark wooden gate will work beautifully as backdrop. The mission's side porch, with its simple immaculate columns and rustic benches, is also a great place to assemble a portrait of the bridal party or of just the bride and groom. The exterior of this stunning structure also offers a set of stoic white arches under which your wedding photographer can pose the happy couple. 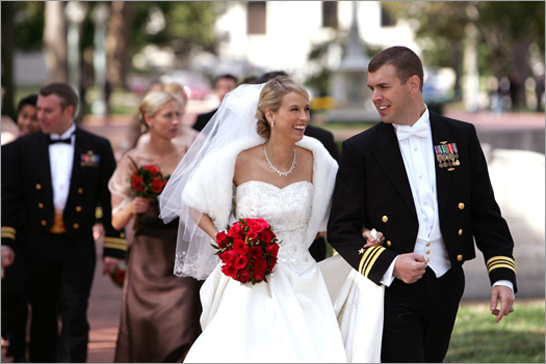 The final destination on your wedding photography itinerary will be the Admiral Baker Golf Course, a popular choice for military weddings located only a few miles away from Miramar Station. Begin your wedding photography shoot outside the entrance, which boasts tall verdant palm trees typical of San Diego. Inside the clubhouse, your photographer can situate the bridal party in front of the windows so as to capture a beautiful panoramic view of the golf course and of the mountains in the background. Finally, have your photographer snap some photos in the gorgeous Presidio Ballroom or on the Patio Terrace. Follow this wedding photography itinerary for an unforgettable military wedding in San Diego!